Take a stroll down memory lane on our web page devoted to classic kayak videos. We will update the page a few times a month as more long-boat, old school historical footage becomes available. Description: Rob Lesser returns to the Grand Canyon of the Stikine with Gerry Moffatt , Reggie Crist, Doug Ammons, Charlie Munsey, and Wink Jones. In the eighteen years since Rob Lesser's first descent ony eleven other paddlers have completed a successful run of the Grand Canyon of the Stikine. Featuring: Entry Falls, Wasson's Hole, Guard Dog, The Hole that at Chicago, The Hole that ate the Hole, Site Zed, and Gerry Moffatt's epic run and close call at Scissors. View more videos on National Geographic Video. Description: Chile to Alaska the Ultimate Quest for Whitewater Action Time stands still when "PaddleQuest" joins the world class athletes of the TIMEX Expedition Team on a transcontinental quest in search of the ultimate whitewater ride. This journey will take you from the turquoise waters of the dam threatened Futaleufu, to the spectacular "River Wild" waterfalls of the Kootenai. You'll witness record-level runs down Devil's Canyon of the Susitna and feel what it is like to stare directly down a kayak at an Alaskan Brown Bear. Move over Lewis and Clark; step aside Columbus. Make way for today's hottest boaters on an epic expedition that won't soon be forgotten, "PaddleQuest". Starring: Dan Gavere, Corran Addison, Chris Spelius, Dean Cummings, Tommy Moe, Grant Amaral, Brennan Guth, Bernd Sommer, Arnd Schaeftlein, Jamie Simon, Adan Shandro and Mark Brown and friends. MUSIC: Blind Melon, Blue Hawaiians, I Mother Earth, LIR, The Mudsharks, The Samples, The Radiators, Ugly Americans. Rivers: CHILE: Futaleufu, Rio Fuy, Rio Plaquin, IDAHO- Lochsa, North Fork of the Payette, MONTANA- Swan River Mad Mile, Clark Fork, Kootenai Falls, Yaak, ALASKA- Devil's Canyon Susitna, Talkeetna, Six Mile Canyon, and Ingram Falls Creek. Description: The American Sportsman television coverage of the first descent of the Grand Canyon of the Stikine in 1981 (aired 1985). The descent was led by Rob Lesser with Don Banducci, Lars Holbek, Rick Fernall and John Wasson. Featuring: Entry Falls , Wicked Wanda, Wasson's Hole, Site Z (zed), and the Tanzilla Confluence . Description: In addition to ABC's coverage on The American Sportsman, the descent was also featured on some of the local television news shows. Check out the interviews of Chris Spelius, Ken Lagergren and others, as well as some epic kayak footage. Description: In 1993 this video captured first prize in the annual National Paddling Film Festival in Lexington, Kentucky. It covers a Kayak Safari Trip in Chile featuring the Rio Bio Bio, Rio Fuy and Rio Futaleufu. Many who see this video still comment on the quality of the plot and video production. It really captures the essence of what it is like to paddle in Chilean Patagonia. Description: In 1995 "The Extremists" television series profiled Chris Spelius, Expediciones Chile and the Futaleufu River. Experience Chile 1990s style in this old-school video. Also offered at the Patagonia South Kayak School: Beginning Kayak Instruction, Intermediate Paddling Instruction, Advanced Paddling School Courses. How to Roll a Kayak clinics and private kayak instruction. Chile & Argentina Adventure Travel. Rafting Chile & Argentina Kayaking. Torres del Paine and FitzRoy trips. Argentina Chile & Patagonia travel information. Secrets of Patagonia Tour on our website. Information about the Patagonia climate and seasons in Patagonia, Chile & Argentina. Sea Kayaking Chile from the Andes to the Ocean on Lago Yelcho. Fjords, hotsprings, temperate rainforest. Yoga Travel VacationsTry your favorite multisport activities during a yoga travel vacation. Checkout the instructional, large group and corporate programs we offer. Horseback Riding Vacations and Equestrian holidays with with Guachos & Criollo Horses. Information on travel agent discounts and commisssions from Expediciones Chile. Skiing Chile Head south in July and August for summer powder in the Andes. Skiing Chile, Patagonia and Argentina. Swiftwater Rescue Training Thinking about a rafting guide job on the Futaleufu? Check out our whitewater guide school & swiftwater rescue training course. Outdoor employment opportunities in rafting, kayaking and fly fishing. Internships available. Experience a genuine Patagonia mountain bike tour through Chilean Patagonia. 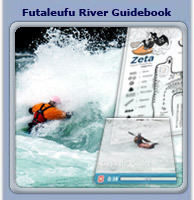 Take a detailed and interactive tour of the rapids of the Futaleufu Valley with our online Futaleufu Guidebook.